Campbells Cream Of Chicken Soup 1969 Ad. This color May 9, 1969 ad states did you know Campbells Cream of Chicken Soup is leading a double life. Cream of Chicken Alias Brunch Benedict. Recipe for Brunch Benedict Included in Ad. Picture shows bowl and can of Campbells Cream of Chicken Soup. Also three plates of Brunch Benedict. Magazine tear sheet picture is taken through plastic and may show wrinkles or crookedness that is not in the ad. This Original magazine tear sheet measures 10 1/4 inches wide by 13 3/4 inches tall. 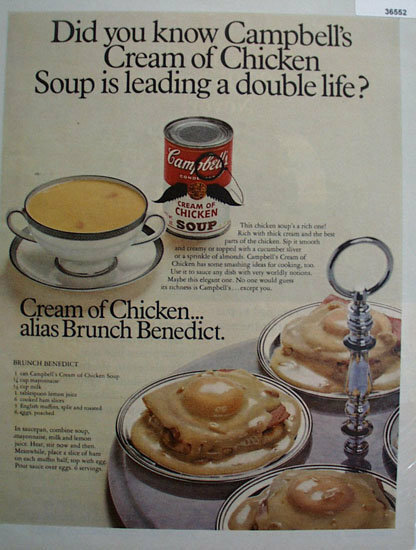 Items Similar To "Campbells Cream Of Chicken Soup 1969 Ad"